The title is not lying, this is actually one of my good ol’ movie reviews! Trying to get back into the swing of blogging every once in a while. I hope you enjoy it! On Sunday night, JC and I went to see Shutter Island (avoid Wikipedia links if you haven’t seen the movie and don’t want to read spoilers). It is really nice to have a new movie buddy and we’ve seen a few movies recently. None have really made me want to run out and blog though. On Valentine’s Day I brought her to a wonderful dinner at Portobello Trattoria at Downtown Disney and then we caught a showing of Valentine’s Day. I enjoyed the movie and it has everyone in it. EVERYONE. Cute, romantic comedy and I believe a perfect Valentine’s Day movie. Don’t expect me to write a post about it and don’t expect me to buy the DVD. But if you want to rent a cute movie next Valentine’s Day? Check it out. 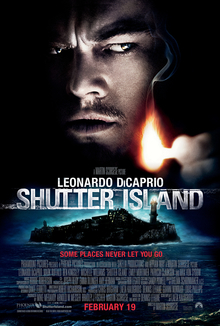 Back to the real reason for the post, Martin Scorsese’s Shutter Island. This movie stars Leonardo DiCaprio and brought up an interesting thought on my part: Have I ever seen a movie starring Leonardo DiCaprio? I can hear you, well, most of you. You just scoffed at the notion that I hadn’t seen a DiCaprio movie. I have never seen Titanic. Of course I’ve seen parts of the movie, but I’ve never seen it from beginning to end, something JC plans on changing. While working on this post I spent time going through every film on DiCaprio’s filmography (thanks to Wikipedia) and I can honestly answer the previous question. No, I have not seen any of Leo’s movies.